Home / Stock Picks / Hot Stocks / Is It Time to Buy Disney Stock Now That Beat Comcast’s Bid? Is It Time to Buy Disney Stock Now That Beat Comcast’s Bid? The bidding war appears over. At least, the bidding war between Disney (NYSE:DIS) and Comcast (NASDAQ:CMCSA) for most of the assets from Twenty-First Century Fox (NASDAQ:FOX, NASDAQ:FOXA). The news sent Disney stock higher by 1.3% and ironically, Comcast stock up 2.6% as well. For its part, shares of FOX initially fell on the news. However, shares were roughly flat by the time the stock market closed on Thursday. The bidding war has come to a sensible end. Disney stock rallied as investors are finally going to see the House of Mouse land its prized possession. Comcast shares rallied as the company is no longer being sucked into a very costly bidding war that it likely wouldn’t win. Comcast dropping out of the deal is good news and bad news for Disney. For starters, it’s paying far more than the $52 billion that Fox and Disney agreed on in late-2017. The deal has now swelled to $71 billion, a more than 36% premium to its original offer. Comcast really landed a blow with that move, but it gets worse for Disney. Fox owns a 39% stake in Sky, a property that Disney CEO Bob Iger has called a “crown jewel” in the past. Fox has been working on a deal to buy the rest of Sky that it doesn’t already own. Ordinarily, Disney investors would be pretty excited to be getting that property. However, Comcast has been trying to outbid Fox for the remaining stake in Sky. Fox/Disney appear that they will not win that bidding war, as the company said it will not increase its offer following Comcast’s move to back off Fox assets. What went from a win-win for Disney, has sort of lost its luster a bit. It won’t get the rest of Sky that Fox doesn’t own and it will pay an extra $19 billion for Fox. All thanks to Comcast, which will now likely get the majority of Sky. That said, both Disney and Comcast are high-quality companies. Comcast’s M&A record when it comes to large deals is essentially impeccable. Even when shareholders have not wanted to do the deals. In particular, CEO Brian Roberts has done a great job. So I’m sure the Sky play will work out well and since it wanted Fox so bad, I have a feeling it will worthwhile for Disney too. Disney now has a ton of content and even more distribution. It also has controlling interest in Hulu too, getting Fox’s 30% stake to go along with its 30% stake. With the latest news, Disney stock has been rallying. Shares are up from $100 in early June to $112 currently. 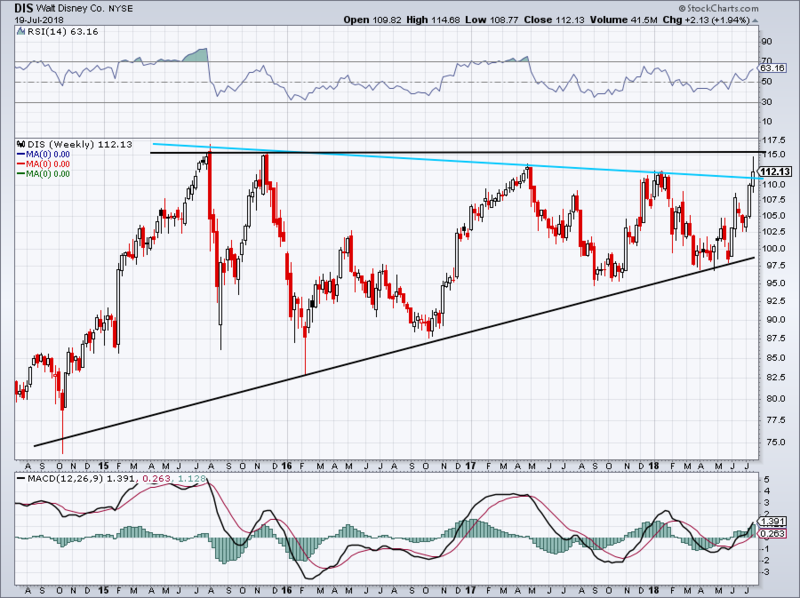 The 12% run could just be the start though, if Disney is able to breakout. There’s clear resistance up near $115, a level that Disney hit twice in 2015. After failing to breach this mark, Disney stock put in a series of higher lows over the course of several years. All the while, a downtrend resistance line formed (blue line). Over the last 18 months or so, this has come into play near $112. Disney stock is technically above this level right now, on a weekly basis. Closing out the week above $112 would put it on course to retest $115, a level it hit on Thursday after the Comcast-Fox-Sky news. If it can push through $115, then Disney stock could go on a big rally. We have been avid about buying DIS near $100, most recently making the claim in April. Now though, it’s a little trickier. More aggressive investors can buy Disney stock on a close over $112 this week. For more conservative investors who want to see Disney with more momentum, they can wait for a close over $115 or for a larger pullback into previous support. This deal will be costly, but trading at 15 times earnings isn’t exactly expensive. Particularly for a high-quality blue-chip stock like Disney. Article printed from InvestorPlace Media, https://investorplace.com/2018/07/is-it-time-to-buy-disney-stock-now-that-beat-comcasts-bid/.